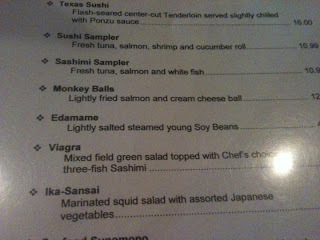 Texas Sushi, Monkey Balls, and Viagra. Just kidding. Most of us ordered chicken, one person ordered shrimp tempura and one person ordered a bento box (Texas sized). But that's not the only way we're celebrating the anniversary! The blog's got a whole new look, starting...now! Best of all, we're giving away prizes! Starting next Tuesday, we'll give away one prize a week for the rest of June 2011. Includes: a classic silent film, Dr. Jekyll and Mr. Hyde; The Terror starring (a young) Jack Nicholson and Boris Karloff, and an I Love Zombies magnet. Includes: The Bat, starring Vincent Price and Agnes Moorehead; a travel chess game; and a magnet with a legal pun. Includes: The Ape Man, starring Bela Lugosi; American Vampire, starring Carmen Electra as a vampire and Adam West as a vampire hunter; a magnet with a diagram of what to do in case of vampire, and a handmade cross bookmark (generously donated by reader Michelle R. of Texas. She also donated the chess game in Giveaway #2). We make no guarantee that your items will arrive upside down as pictured. Send an email to mamcwells at gmail dot com (replace 'at' and 'dot' with appropriate symbols). Title it "Anniversary Contest". In the body of the email list out your name and city / state of residence, and swear that you're at least 18. Winners will receive an email asking for a current mailing address. Drawings will be at noon on the days listed above. Winners will be announced on the blog by first name, last initial, and city / state. Giveaway open only to residents of the continental US. Must be at least 18 years of age. Prizes can't be exchanged, and I vouch for the quality of nothing. One entry per person...unless you are the first person to correctly answer a quiz question! Quiz questions will post on this blog June 7, 14, and 21. Answer a question correctly and you could double or triple your chances of winning a prize. What is the significance in the name of the law firm featured in the stories (Deitrick, Egbert & Drake)?